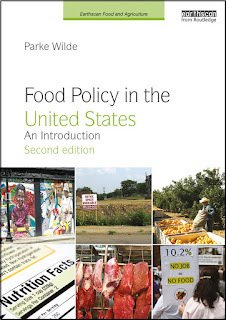 An excerpt from the first chapter of Food Policy in the United States: An Introduction (Routledge/Earthscan). 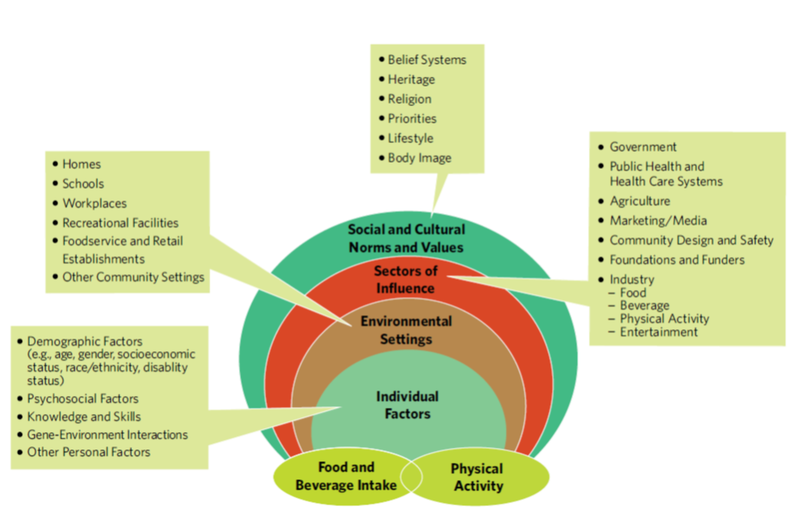 The 2010 Dietary Guidelines for Americans, which is the federal government’s most authoritative official statement on nutrition and health issues (discussed at length in Chapter 8), presents a social and ecological framework for food consumption and physical activity decisions (see Figure). Similar models are found in many other high-profile nutrition policy documents (Institute of Medicine, 2012). To analyze major national problems of obesity and chronic disease, this framework goes far beyond immediate causes such as food and beverage intake and physical activity. Like planetary orbits that are farther from the center, the outer layers list more distant influences on food choices. The framework calls attention to important topics, including agriculture (Chapter 2), the food and beverage manufacturing industries (Chapter 5), the retailing and restaurant industries (Chapter 6), marketing and the media (Chapter 9) and socioeconomic factors (Chapter 10). Once nutrition and public health professionals begin to explore these more fundamental influences on food and beverage consumption, they find themselves engaged with challenging topics in economics and political science. At first, this engagement can be unnerving. When interacting with patients, professionals in medical fields are rightly proud of their ability to diagnose problems and prescribe an appropriate remedy. It is tempting at first to adapt this medical patient approach to food policy applications. For example, if expanding food portion sizes contribute to rising rates of obesity, it is tempting to say government agencies should prescribe smaller portion sizes. If nutrient-dense foods cost too much, it is tempting to say government agencies should prescribe a price ceiling for fruits and vegetables. It is disappointing if policy-makers reject such proposals as politically infeasible. It is downright frustrating if policy-makers say with a straight face that a well-intentioned nutrition policy prescription is unwise. Yet, except in special settings such as school meal programs, determining portion sizes may be a decision that people do not want to delegate to their government. A price ceiling for fruits and vegetables may have unintended consequences, such as reducing the incentives to grow fruits and vegetables. The outer layers of the social ecological framework bring nutrition policy into contact with many other societal objectives, such as a thriving economy, a healthy environment, poverty alleviation and effective political governance. Powerful policy actors in these outer layers do not—and sometimes should not—behave as if food consumption and physical activity stood alone as the sun at the center of the social ecological solar system. Governments balance food and nutrition concerns against other considerations, just as individuals and families do. As we explore more deeply the normative question of what food policies best serve the public good, it will appear necessary to discern which decisions should be delegated to governments and which decisions should be made by individuals interacting in economic markets. And, as we explore more deeply the positive question of what policies can win political support, it will appear necessary to anticipate how a variety of producer and consumer interests will respond to such proposals. These inter-disciplinary explorations are more difficult than simply prescribing the right policy medicine, but ultimately they offer both sharper policy insight and greater potential for political success. Source: Dietary Guidelines for Americans, 2010.